What happens when an author, a street artist, and a videographer collaborate on a project? It looks something like this! The Martians in Your Classroom: STEM in Every Learning Space just turned into STEAM in Every Learning Space! Coronado is a neighborhood in the heart of Phoenix, Arizona. It’s rich with culture and community gatherings, one of them being the annual Oak Street Mural Festival that occurs in March of each year in alliance with Art Detour, Mob Action University, and Murals of Phoenix. Thousands gather to walk the small alley street between 14th and 15th Avenues. 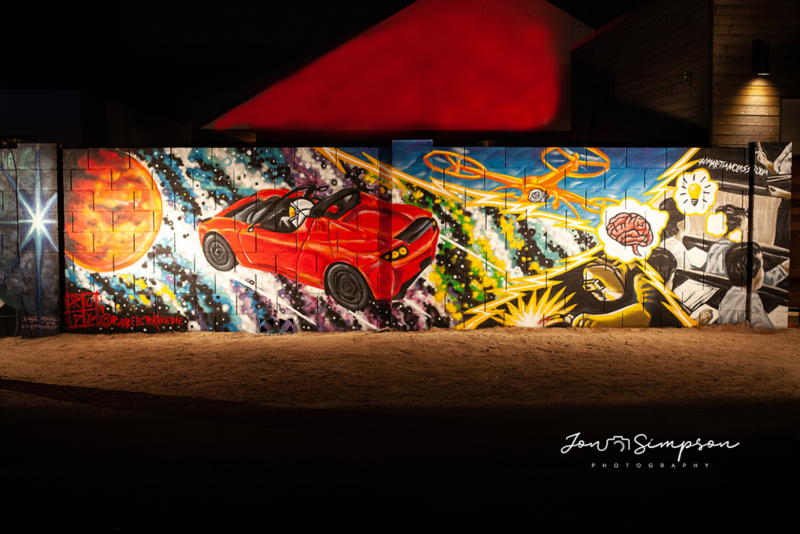 In addition to viewing over a dozen of Arizona’s top local street artists as they transform the walls of the alley, the festivities include live bands, food trucks, a community mural, games for kids, and a wall that is set aside for kids to explore their artistic side. I opened up my garage that leads into the alley for kids to come in and paint their own canvases and cover the floor with their own colorful expressions using sidewalk chalk. Oak Street has seen a huge transformation over the years which adds to the significance of this event. What was once an alley filled with debris, drug needles, and crime, has now been transformed into a landmark as a must-see urban art gallery, in which locals and tourists alike stroll or ride bikes while soaking in the culture and creativity. Folks pose by the walls, taking advantage of the stunning backdrops. Some even have weddings here, inviting the community to attend. So how does EdTechTeam and The Martians in Your Classroom fit in? Well first, let’s start with who are the Martians in your classroom? They are the youth of today, whether in your classroom, your community, or in your own home, and they could be the first Martian colonists! But more than that, whether growing up to experience life on or off of planet earth, young people are experiencing and interacting with the world around them in a way that is completely different and foreign to the world that we grew up in. In many senses, they are growing up in a different world altogether that might as well be on another planet than the world we experienced as kids. The Martians in Your Classroom: STEM in Every Learning Space was released in June 2018. I had the great fortune of coauthoring this book with Stephen Sandford, a former NASA engineer and founder of Psionic Lidar. When determining the subtitle and content, we struggled with determining whether to reference STEM or STEAM throughout the cover and inside contents. I am frequently asked the question, “Why STEM instead of STEAM?” and this street art project surrounding the book is a perfect time to address this question. Art is everywhere and is apart of so much of our daily lives without even noticing it. When I think of the art that goes into STEM, design is what really stands out and connects with STEM. It covers the artistic aspects while also touching on design thinking, designing for human experiences, design cycles, and design phases. But I feel pretty certain that my new version of the acronym isn’t going to catch on anytime soon. Art is part of each of the STEM areas and is discussed throughout the book. Another aspect that we took into consideration is that STEM is used to emphasize areas that are facing huge shortages in the workforce, including education. Fortunately, we do not have a shortage in artists. So, for the purpose of The Martians in Your Classroom, STEM it is. So back to the street art project during the Oak Street Mural Festival, my husband and I moved to Coronado a few months ago, and the builder shared that they had to tear down and rebuild two of the walls behind our home leaving our portion of alley bare of the beautiful street art, but that we could commission an artist to recreate what was previously there or come up with a theme of our own. 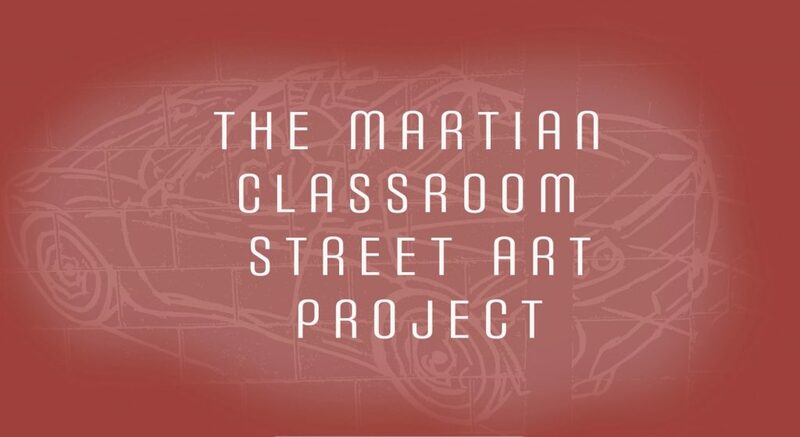 I jumped at the opportunity to explore the link between art and STEM with a Martian in Your Classroom street art theme and the Oak Street Mural Festival. Soon after the first draft of The Martians in Your Classroom had been submitted to the publishers, Elon Musk launched his cherry red Tesla into space. In addition to being a monumental victory for space enthusiasts and a move forward for space travel, this also created a shift in thinking. Who can launch what into space, thus creating a need for policies governing future initiatives, along with an effort to track Starman’s one-way ticket to explore the universe. Most importantly, this signifies a step in the right direction as this is the most powerful rocket to fly in decades and could be the rocket that usher people to Mars someday. This image masterfully represents the theme of The Martians in Your Classroom which boils down to thinking bigger when it comes to education and creating learning spaces that inspire our students to do the same. Everything is impossible until it’s not;whether it’s drones, Elon Musk’s cherry red Tesla with Starman floating towards space, or exploring Mars, it all starts as an idea in someone’s head and moves into the belief in the idea and the empowerment to do something with it. Peter Diamandis says that the day before a breakthrough, everything is just a crazy idea. The crazy ideas that are inside our students heads are tomorrow’s life altering breakthroughs. Encourage the Martians in your classrooms to think big and to dream impossible things. And let them share and explore those ideas in many expressions: write it, speak it, build it, draw it paint it, dance it… And maybe even spray it!